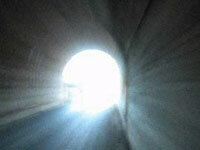 About one fourth of those who had the so-called near-death experience say that they could see themselves out of their own bodies. Mystics insist that the fact proves the existence of soul, assuming that only soul that can leave the body and see it from outside. Psychiatrists and neurophysiologists call the phenomenon "out-of-body experience." The phenomenon has been closely studied for many years. Researchers state that it is not connected with near-death conditions only. Scientists show that people may have out-of-body experience under the action of drugs, as a result of stress or some diseases. Leading researcher from the Russian Academy of Sciences Institute of Brain based in St.Petersburg, Professor Leonid Spivak fixed the phenomenon with women in childbirth. Every tenth woman he observed reported about her out-of-body experience. He told that those women said they saw themselves, doctors and nurses, also their wardmates from a height of 2-3 meters. They suddenly felt as if floating above the body and the new experience stopped their pain and gave them appeasement. The return to their body was also sudden and occurred in a minute after the soul left the body. At that, the women again felt pain. There are thousands of instances of out-of-body experience but until recently researchers could take on trust only what their patients told about the experience and had no opportunity to feel what it is like. Now they have a chance to have this experience thanks to a trick invented by researchers from the University College in London. Head of the Institute for Psychophysical Researches in England Selia Green gave a definition of out-of-body experience in 1968. She defined it as ‘... one in which the objects of perception are apparently organized in such a way that the observer seems to himself to be observing them from a point of view which is not coincident with his physical body.’ Selia’s contemporary colleagues who consider the definition perfectly exact have recently published the results of their experiments in the journal Science . The researchers managed to reproduce exactly what Selia described. A patient was asked to wear a helmet with video displays on his head. Two cameras placed a couple of meters behind the man under the experiment sent stereo images to the displays. The man saw only what the cameras transmitted; in other words he could see himself from outside. At the same time, the researchers were stroking their patient with a stick that he could not see and simultaneously stirred another stick in front of the cameras. So, it seemed to the patient that the stick was touching his virtual body as if the soul was being scratched. Participants of the experiment felt both scared and excited; all of them felt that they actually left their bodies. Some patients got naturally scared when the researchers waved a baseball bat in front of the cameras and pointed it at the groin area. The patients immediately shielded their groin areas the way football players do during penalty kick. It is amazing that when after the experiment the volunteers were asked to demonstrate in what part of the room they stayed during the experiment the people pointed at the place where their virtual bodies were and never mentioned the real one. The head of the experiments Hendrick Ersson tells that out-of-body experience is not something supernatural. This is an illusion generated by some processes in the brain as a result of which the brain easily takes this deception for reality. Professor Spivak supports the opinion as he thinks that cortex of the temporal region responds to this out-of-body experience. Doctor Olaf Blanke, a neurologist at Geneva University Hospital reproduced out-of-body experience without cameras and clinical death. In the British journal Nature he described an experiment with a 43-year-old patient suffering from epileptic seizures. To study the woman’s disease the researcher implanted electrodes into her brain to stimulate the right temporal lobe and accidentally excited her angular gyrus, the structure connected with the organs of vision, sense of touch and organs of equilibrium. As a result of the experiment the patient could see herself from outside without provoking clinical death. Doctor Blanke was also surprised with the results of the experiment. He supposed that probably when a person is in stress his brain somehow stimulates the gyrus that helps send information about the position of his body to the visual cortex. Visual cortex in its turn interprets it its own way, intermixes it with other images it has and projects it to the retina. This produces the effect of inverted vision, and the man feels as if he sees himself from outside. The researcher believes that the same happens to patients when psychiatrists speak about split personality. Materialists mention recent experiments conducted in Wales in this connection. Welsh doctors observed clinical death of 39 patients. The doctors painted big symbols on paper and placed them close to the patients experiencing clinical death. At that, none of the patients who had out-of-body experience noticed the symbols at all. Parapsychology expert from the West England University Susan Blakmore says that now that researchers believe out-of-body experience to be a natural phenomenon this does not mean that no astral body, soul or spirit exists. This obviously demonstrates that there is no need to invent them. The out-of-body experience is not a mere evidence of life after death but rather an exciting occurrence that any of us can experience.